This is a continuation of our previous blog post Optoma UHD65 vs UHD60 where we compared color, contrast, and brightness. Here we will look at detail, motion processing, and share with your our conclusion. Since both projectors are the same resolution, we did not expect to see a noticeable difference in detail and sharpness. We were surprised, however, that there is a very noticeable difference in perceived detail and sharpness if the projectors are both calibrated and set up correctly. The reason, we concluded, was that the perception of the viewer is based on the whole of what he or she sees. 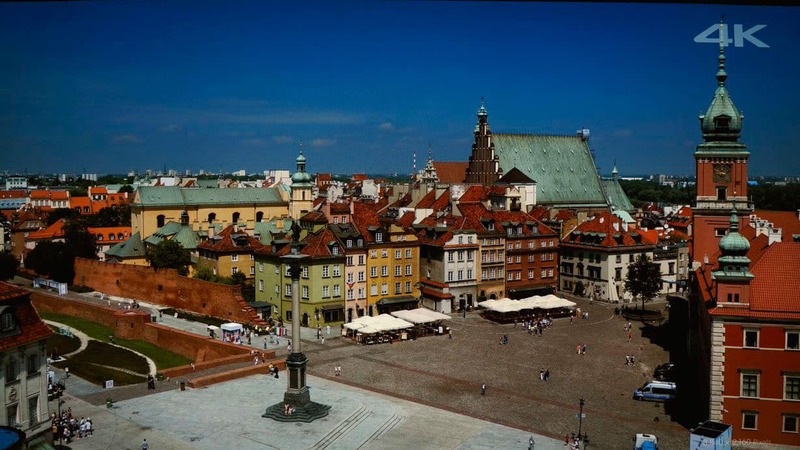 In this case, the more saturated color (color brightness) and the higher contrast of the UHD65 combine to make the viewer think he is seeing better resolution or sharpness, where, in reality, they are the exact same pixel resolution. In our comparison for detail, we also flipped the image of the UHD65 on the right so you are seeing the exact same part of the image for comparison on these closeups – mirrored next to each other. Compare the detail and contrast in the fine leaves and also in the crisscross patterns to see the differences. The UHD60 is on the left and the UHD65 is on the right. We first thought our black levels were off, but we went back and re-adjusted the pluge so that the UHD65 was actually slightly higher or lighter than the UHD60. Then we went back and compared again. Once more, the color and contrast affected our perception, and the UHD65 absolutely appears sharper and more detailed even though, theoretically, they are the same pixel or spatial resolution of UHD 4K. The projectors look very close (especially in person and in the video). However, the UHD65 on the right, looks slightly sharper due to the color and contrast differences. This difference in perceived detail is very real to the viewer of the projected images. We even had multiple viewers check our initial impressions to be sure, but it is very clear that the higher contrast and richer color of the UHD65 affects our perception of the detail in the images. They are the same pixel count and test the same on test charts – but they do not look the same on most images. This is a perfect example of why we feel the side-by-side is always the best way to make product comparisons. There are those who claim this new UHD chip used in both the UHD65 and UHD60 are not true or native 4K. According to Texas Instruments, who manufacture the imaging chip, and the Consumer Technology Association, these products are considered and meet the criteria for delivering 8.3 million pixels to the screen. 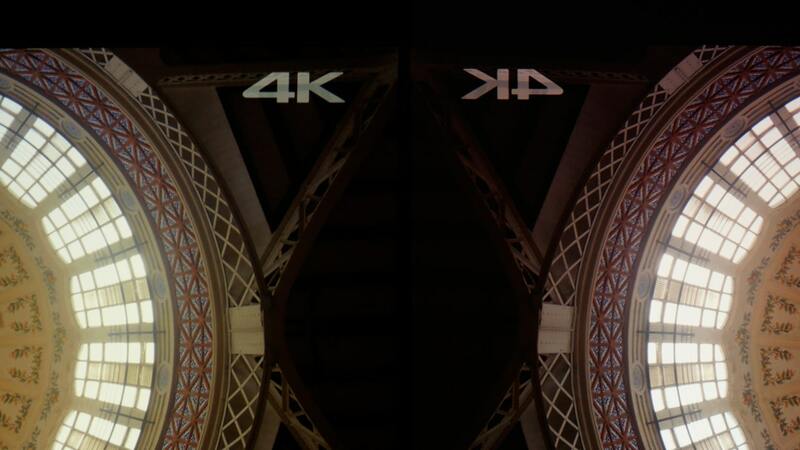 There are actually two main flavors of 4K: one is a professional standard for motion picture capture and display, the other is consumer. The main difference is aspect ratio: the professional is 17:9, and the consumer is 16:9. The new 4K Blu-ray discs are UHD or 16:9 (or whatever the director dictates) – which is 3840 X 2160 pixels – so that is what these projectors are capable of displaying. We here at TVS Pro are more concerned with what they can actually display to the screen, regardless of the technology used to get there or who says what they really are. Here is the visual comparison compared to a Sony’s XBR-65A1E OLED 4K (native UHD 4K pixels) display used as the reference. This image, taken directly off-screen, is an image of the Sony native UHD 4K OLED used as reference for comparison below. Notice the clock face in the middle on the right. Because it’s difficult to see the differences at these sizes, click on the images to see the larger size. 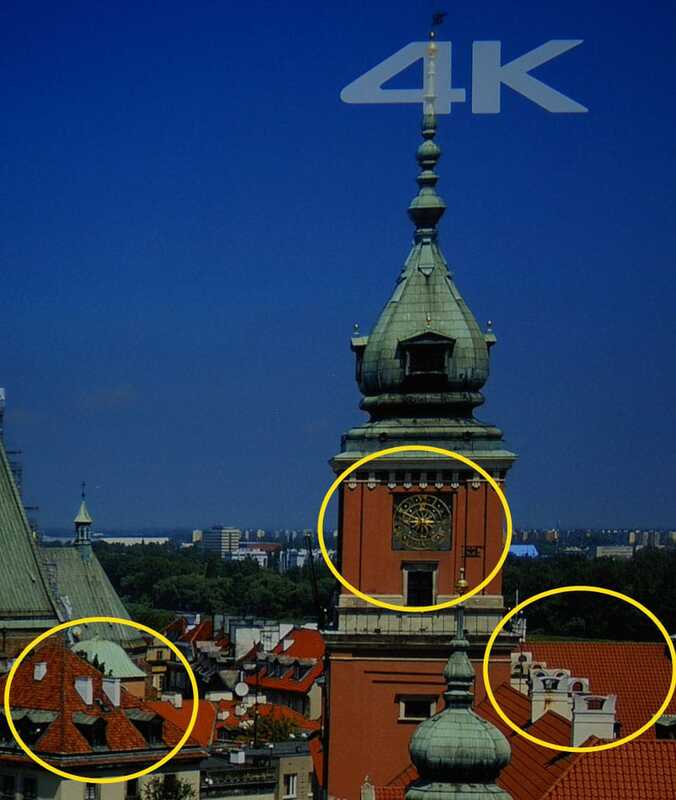 Pay particular attention to the detail in the images specifically in the roof tiles and the clock face. 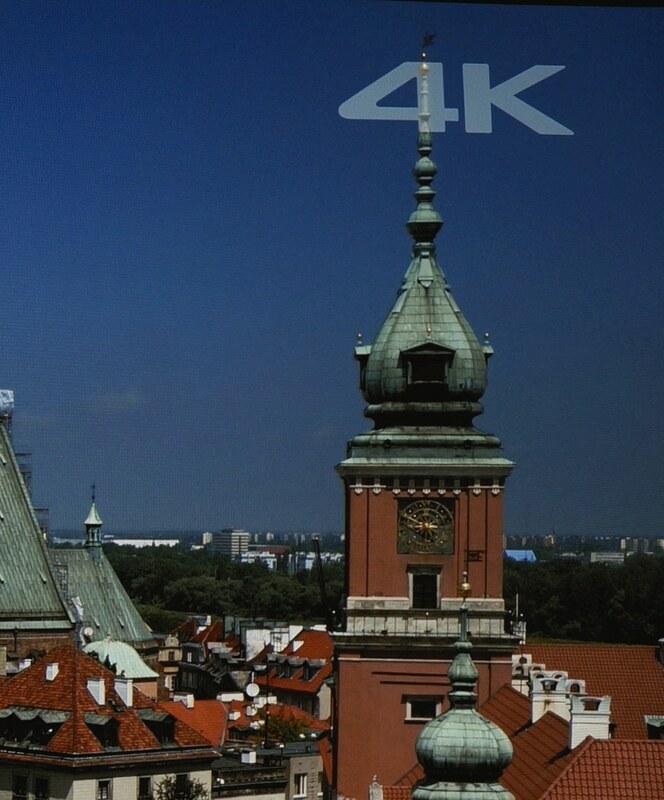 Here is a close up of the above image on the Sony OLED which is “true UHD 4K”. 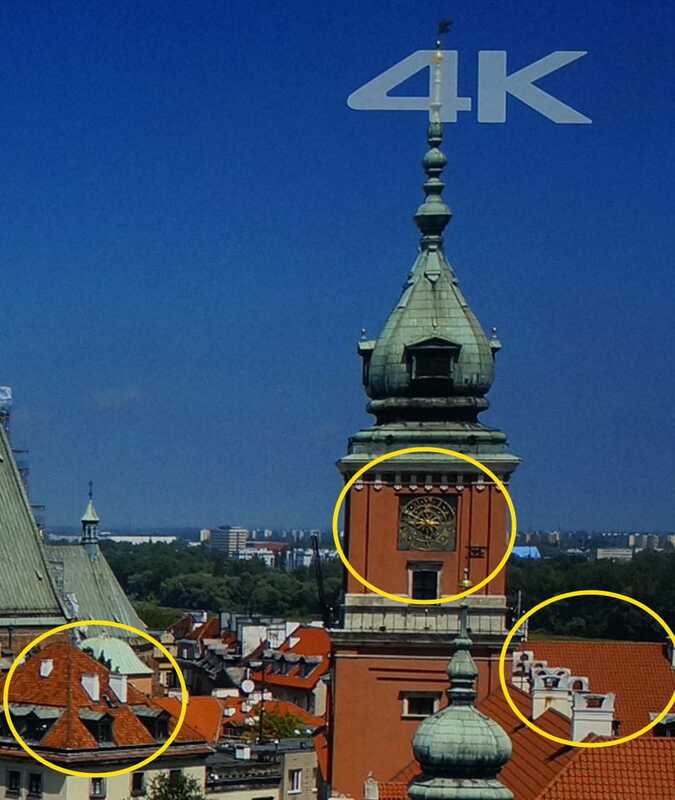 Here is a close up of same image, but on Optoma UHD60, again taken directly off-screen with camera. Here is a picture taken of the pixel shift (non native 4K UHD) on the Epson Pro Cinema LS10500 projector of the same image. 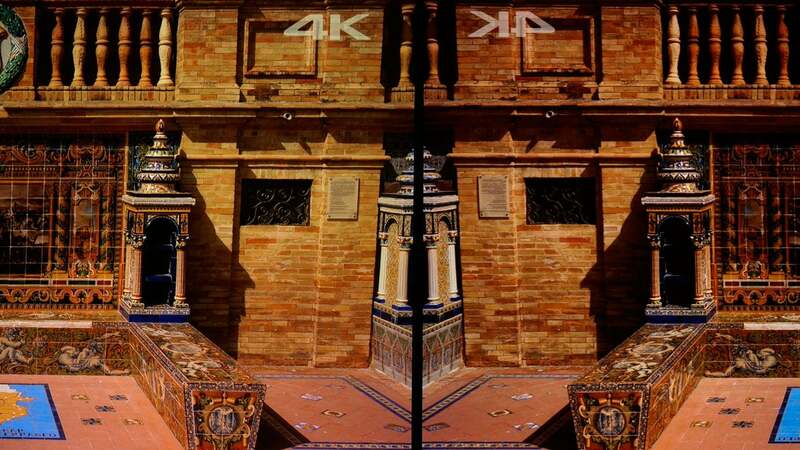 For us, the key to native or “true” 4K is in the image quality itself. We could not see any difference between the detail in the native UHD 4K OLED and the Texas Instrument implementation in the Optoma projectors as can be seen above. It is not a little improvement over the shift methods used by some manufactures; it is a significant and dramatic improvement at typical viewing distance. One of the key differences in the projectors is in the motion processing with frame interpolation. The UHD60 does not do any frame interpolation, whereas the UHD65 has three levels of what Optoma calls “Pure Motion”. The first level makes a significant difference and some may consider it to be the best for watching movies: those who are sensitive to judder or the effect of motion when images are captured at 24 frames per second (as most movies are). There are some residual motion artifacts which help the mind to know that this is a movie and not a live sporting event or live TV drama. 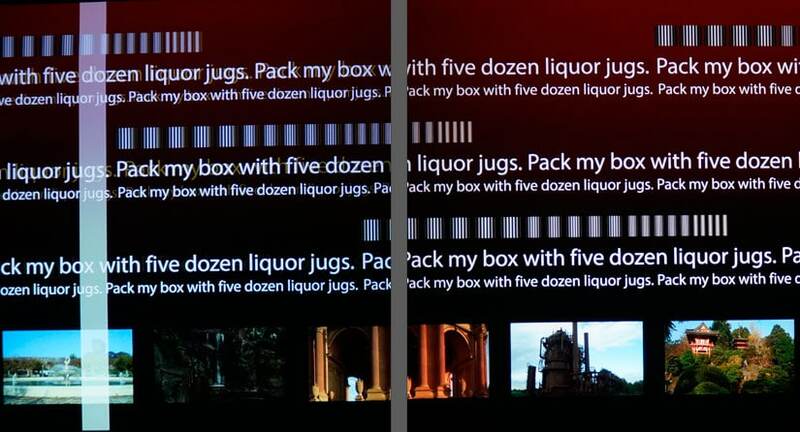 Notice the UHD65 on the right is perceived as smoother and without the secondary ghost or judder (double image blur) as seen on the on the left text (because this still image is confusing, a gray line was added in photoshop to help indicate where one projector ends and where the other starts). The white vertical bar is also moving (to help evaluate motion) and only seen on the UHD60 in this picture. The white bar on the right was further to the right of where this picture was cropped. Please see our video for a better understanding as still pictures just cannot capture motion. Some movie purists do not like any frame interpolation of any kind; others just want a slightly smoother image; and some like the full level 3 smooth compensation. The UHD65 lets the user decide: off, level 1,2, or 3. Commercial digital motion picture theaters show movies at 72 Hz refresh, but it is not adding interpolated (created) frames to the film, just reducing flicker. If 24p movies are shown at 24Hz, there is a noticeable flicker and it is very distracting – hence the higher refresh rates. There is a slight penalty for some gamers – it is an increase in processing speed and response time. We are not a lab, nor have the equipment needed for testing frame delay so we will defer to other labs to measure for a more definitive measurement on frame delay. We fully expected to see the differences in color, motion, and contrast with the improvements of the color wheel and processing in the UHD65 – which we clearly saw. What we did not expect was to see how close they are in terms of brightness, and how the improvement in contrast and color affected our perception of detail and sharpness. In terms of usable and realistic brightness, the UHD60 was about 23% brighter, but at a sacrifice of color accuracy. It is still very sharp and detailed. We would consider neither projector usable for photos or images in their bright 2,200 (UHD65) and 3,000 lumen (UHD60) modes. When both projectors are put in their most accurate color modes, called “reference,” then the brightness is within 10%. On some scenes, the UHD65 even measured 10% higher than the UHD60 in reference mode. Both projectors have their place in the market and we are very happy that Optoma chose to market both versions. If your budget is under $2,000 the UHD60 is absolutely an amazing 4K UHD image for the money. If your budget allows for the UHD65 you will definitely get your money’s worth in increased performance. So far, as of August 2017, the UHD65 is the highest quality 4K UHD projector we have seen in the under $5,000 category. This entry was posted in AV Solutions, Home Theater and tagged 4k, comparison, conclusion, DLP, dlp projector, home theater projector, home theater projectors, motion processing, Optoma Projector, optoma projectors, projector comparison, uhd60, uhd60 optoma projector, uhd60 projector, UHD65, uhd65 optoma projector, uhd65 projector.